She is NOT part of the royal family but she is known as "Princess" in Singapore's blogosphere. After reading her entry about The Princess Room, I was like, O.M.G!!! My eyes were blinded by pink! She even painted the pink and white stripes wall herself! But what really impressed me was the way she neatly organized her stuff. *thumbs up* I must say that she is a very well-organized person. 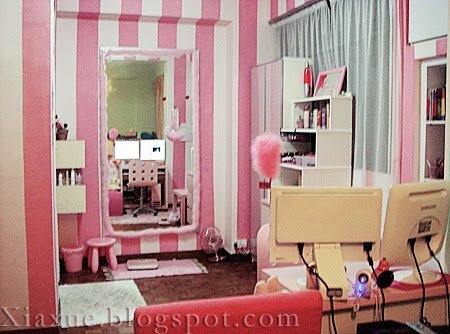 I wish I had a neatly organized room painted in tiger stripes like that!